HAVE I GOT AN EASY TERIYAKI SAUCE FOR YOU! We always have leftover turkey after the holidays so having a few quick turkey recipes up my sleeve is important. There are only so many hot turkey sandwiches one can eat so I created these flavourful turkey chunks in a homemade teriyaki sauce. What does the word teriyaki mean anyways? This is a go-to recipe of mine which doesn’t take long to make especially for those of you looking for quick dinner ideas. If you like to meal plan like I do you can also make the turkey chunks with teriyaki sauce ahead of time and freeze them. The teriyaki turkey chunks are easy to defrost in the microwave or a quick re-heat on the stove-top. You can bring this for lunch at work or eat at home as part of a balanced meal. 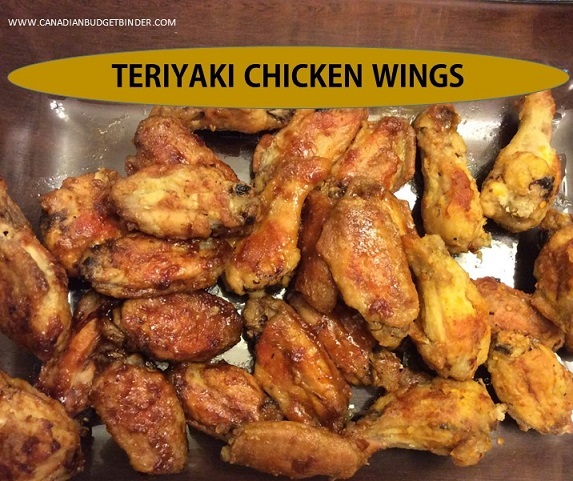 You can also use the teriyaki sauce like I have today to make turkey chunks in teriyaki sauce with a side of vegetables, rice, couscous or potatoes. The sides are endless! If you’re not a fan of turkey you can use it as a teriyaki sauce for chicken or whichever protein you like. I’ve even used the teriyaki sauce for coating crispy wings for a Saturday night in front of the television for my family while cheering on our favourite team. I love recipes that you can switch up which is why I wanted to share this recipe with you today. I’m sure you can think of many ways you could use this teriyaki sauce that I haven’t yet. I have to admit this is not my teriyaki sauce recipe but a friend of my mother-in-laws and it’s the best teriyaki recipe I’ve ever tried. We had this gorgeous sauce at their house while attending a dinner party and I just had to have the recipe. Once I made the teriyaki sauce recipe at home I decided not to use it as a marinade but as a sauce for my leftover turkey chunks along with some basmati rice. I had to thicken the teriyaki sauce with corn starch to give it the thickness it needed along with a knob of butter to make it shine. It’s a quick and easy teriyaki sauce that takes minutes to whisk up. You can even make it ahead of time and keep it in a mason jar in the fridge until you are ready to use it. Don’t waste your money buying those pre-made jars of teriyaki sauce at the grocery store, save your cash. Today, I’m going to teach you how to make teriyaki sauce at home for a fraction of the price. 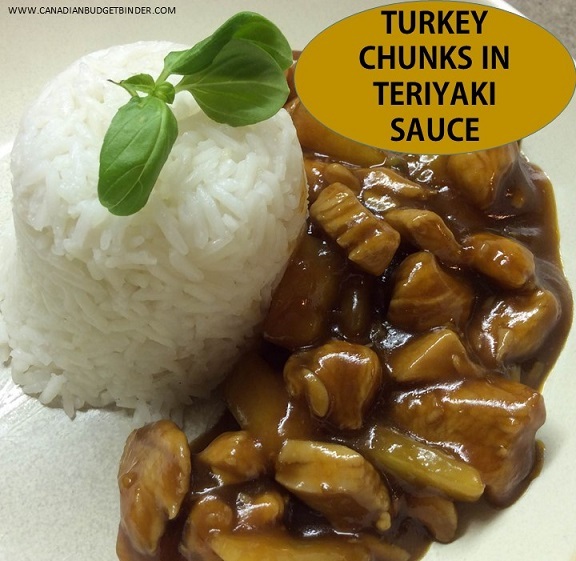 if you love the flavours of teriyaki and buy it in a jar today I'm going to show you how to make homemade teriyaki sauce with turkey chunks. Mix sugar, Ketchup, vinegar, soy sauce, vegetable oil, garlic and ginger in a large bowl until all well combined. Place turkey into bowl and mix well. Set aside for ½ hour as this will allow the turkey to absorb the teriyaki sauce. Scoop out turkey and place in the pan. Don't throw the rest of the teriyaki sauce out we will need it. Once the turkey has cooked now add in the rest of the teriyaki sauce and stir well. Mix together cornstarch and water until it forms a thick paste. Then add to sauce. Finally add 1 teaspoon butter. There you have it a great way to use up leftover meat when time is not on your side in the kitchen. Serve the turkey with teriyaki sauce alongside basmati rice and vegetables. Enjoy this quick meal any day of the week on these cold winter nights. It looks yummy, Mr CBB. I asked my mom to have this Turkey Chunks In Teriyaki Sauce for dinner later. She’s gonna use your recipe. So excited! I can see making this with leftover turkey after the big day!! I’d have to use the ground garlic if my Dad is around as he is much like our Mary Campbell with the fresh stuff…it doesn’t go well with him. I think I will be making this sauce soon to save in the fridge. Thanks Nicola!!! !